Model No. 99DSPT. 14in (36cm) Steel Cable Gun Lock with 1-5/16in (33mm) Wide Laminated Steel Body Padlock; Keyed Different. Best Used For: Guns, Hunting&Shooting Equipment. Product Features 1-5/16in (33mm) Laminated steel body for superior strength 14in (36cm) Steel cable resists cutting 4-pin tumbler cylinder helps resists picking. 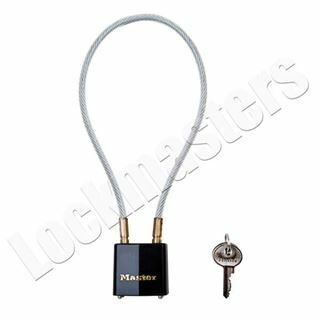 Dead-locking, anti-rap mechanism defeats physical attacks Vinyl covers on lock and cable prevent scratchingProduct Details The Master Lock No. 99DSPT Cable Gun Lock is 14in (35cm) long and is made from braided steel for maximum strength and flexibility. The padlock features a 1-5/16in (33mm) wide laminated steel body for maximum strength and reliability. The Limited Lifetime Warranty provides peace of mind from a brand you can trust.